While uPVC Roofline products are a much cheaper alternative to cast iron guttering, and even many timber alternatives, their high performance and low-maintenance can make them a far more long-lasting choice and Roofline products lifespan, is guaranteed for 10 years and that includes our IsoSeal coating, which will seal your roof eradicating damp for good. uPVC fascias and soffits and barge boards not only provide a greater lifespan than timber, they offer much greater durability. Even with regular maintenance, wooden fascias can quickly degrade, and as such an important part of your home’s structure, this is not a situation that you want to get into. Cast iron guttering can last for decades with the right maintenance, but repairs can be extremely costly. 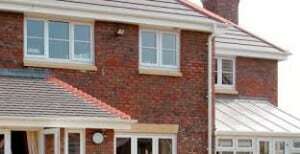 For most UK homes uPVC gutters are the obvious choice for their long lifespan combined with reduced maintenance because they are impervious to United Kingdom’s weather conditions. This can only be a good thing especially for people more senior in years who may not be as able bodied to carry out the repainting and maintenance as required with alternative products which use inferior materials to our uPVC which we guarantee for 10 years, giving you that assured peace of mind. At the Advanced Group our Upvc Roofline products are designed and installed by a team of highly skilled engineers so that you know that what we install is properly designed and installed by a team of professionals with years of experience in giving home’s the perfect facelift and with our guarantee, you know our Roofline products lifespan is going to be 10 years plus. To arrange a FREE no obligation quote to see how our Upvc roofline products can enhance your home you can do this by filling out a request a quote form on the website which will be sent direct to us here or by calling us free on 0800 316 7981!